Three hard-fought points for Liverpool and the personal honour of becoming the club's vice-captain made for a hugely satisfied James Milner on Sunday evening. The experienced midfielder made his competitive debut for the Reds in the 1-0 win over Stoke City at the Britannia Stadium, pairing with Jordan Henderson in the centre. As well as dovetailing in the middle of Brendan Rodgers’ team, compatriots Henderson and Milner will combine in leadership duties too. The manager confirmed ahead of the season opener at Stoke that the No.7 would act as deputy to the captain following his summer arrival. Milner told Liverpoolfc.com: “It’s an amazing honour. Liverpool is an amazing club to be at. “I don’t think it will change my role in any way; you need a lot of captains, vice-captains and leaders and people who are going to talk and help each other out. An even contest against Stoke seemed to be destined for a stalemate, with the score still goalless with five minutes left to play. But Philippe Coutinho had other ideas and the victory was Liverpool’s when the Brazilian sped away from his marker and thundered a drive beyond Jack Butland and into the roof of the net. “I obviously saw him do it a few times last year – so to do it when he was on my team was nicer!” said Milner. “That’s what the game needed. It was a tough game, a battle; I thought we defended really well. It was going to take a moment of brilliance to win the game and we managed to get that. “Not just being the first game of the season, but obviously with what happened in the last game of last season, the boys showed great character. “It’s never an easy place to come and especially for the first game of the season. The crowd is always good here and they were obviously going to be up for it. 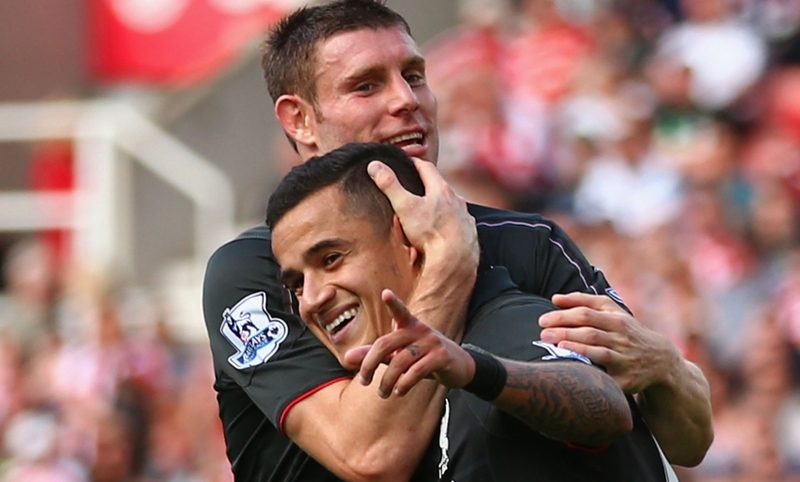 Milner was one of four summer signings to start the opening game at the Britannia. Christian Benteke, Nathaniel Clyne and Joe Gomez were also named in Rodgers’ line-up, while Roberto Firmino was introduced during the second half. He added: “We have got a lot of quality going forward, but a lot of credit goes to the whole team and the back four. “Clyney looks like he’s been here for 10 years; Joe coming in for his first game in the Premier League playing against [Jonathan] Walters, who is an experienced pro, very clever and a tough player to play against – I thought he was outstanding and did a great job.